Pravda, Fidel’s, Ernesto’s…there may be no sign yet of the Pol Pot Pancake House, but Wellington café society does have a definite weakness for using socialist trappings as interior decoration. Certainly, the layers of collectivist chic at Pravda café on Willis St – the bust of Lenin on the bar etc – made for a fairly strange lunch experience for Kunda Dixit, Nepal’s leading investigative journalist and editor of the influential English language newspaper, the Nepali Times. Back home in Kathmandu, this stuff is still very much alive. Maoists happen to comprise the largest political bloc in the country – to the point where the significant political conflicts in Nepali politics this year have not been between the Maoists and the opposition, but among its own cadres. Serious splits have emerged between the three main leaders in the Maoist ranks. 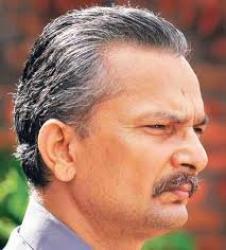 Namely, Prachanda, the former prime minister and guerrilla leader ; his hardline mentor Mohan Baidya (also wellknown by his guerrilla name of “Kiran”) ; and Dr Baburam Bhattarai – who is that rarest of beasts, a committed Maoist widely popular among the public at large, Far more popular at least, than his two rivals..,which may help to explain why the pragmatic Dr Bhattarai is deeply distrusted by the party hardliners. While the Maoists haggle over the correct direction of political strategy, the country’s politics have become totally deadlocked. Since the government lost power in June, there have been 16 failed attempts at forming a new government. Not a good sign – given that by the middle of next year, the same fractious politicians are supposed to agree on the text of a new Constitution for Nepal. In addition, the country has nearly 20,000 armed former guerrilla fighters still living in camps, while the politicians bicker about what to do with them. As Dixit explains, Nepal’s giant neighbours (India and China) are looking on at the impasse in Nepal with mixed feelings of concern and satisfaction. Nothing new about that. Nepali politics have been a volatile mix since, well …at least since the mid 1990s, when Prachanda and his fighters launched their civil war against the tottering monarchy that had ruled the country since 1768. In mid 2001, the Crown Prince Dipendra hurried the monarchy into oblivion by shooting his father King Birendra at a dinner party, before proceeding to wipe out virtually the entire royal bloodline, including himself. Gyanendra, the most senior royal survivor, then became King – and has since been widely suspected (without any concrete evidence) of engineering the massacre. He did, however, comprehensively lose the civil war – and a Peace Accord was signed with the Maoist rebels in 2006. Amid the trade-offs that were deemed to be necessary to get the Maoists to participate in parliamentary politics, Gyanendra became a commoner and took up a business career. The Maoists have since gone back to quarrelling among themselves. India dominates the Nepali economy and it feels some concern that a stable Maoist leadership might encourage its own Naxalite rebels, who have been waging a Maoist insurgency in rural India for decades. To the dismay of the Nepali Maoists, China has not been encouraging to Prachanda – no matter how much he talks up India as being the ‘main enemy’ of Nepal. In recent months, China has flatly resisted any attempt by its ardent Nepali admirer to play off the two regional superpowers against each other. Still, regional diplomacy remains a somewhat delicate matter. As Dixit mentioned over lunch.the Dalai Lama may be the global face of Buddhism – but because of the diplomatic sensitivities he has never visited Nepal, even though it is the birthplace of the Buddha. Werewolf editor Gordon Campbell spoke with Kunda Dixit (pictured left) about the current political situation in Nepal, and about the climate for doing journalism in Nepal. Campbell : What’s the circulation of the Nepali Times newspaper that you edit –and who reads it? So, since the literacy rate in Nepal is barely 60%, you’re talking primarily to the elites. Is the role of journalism understood and accepted by the elites? The traditional leadership had always been very uncomfortable with the concept of press freedom, and with the notion of democracy. These days of course, [the political elites] don’t want the boat rocked. Back in the absolute monarchy days, press freedom didn’t exist, and political parties were banned. In 1990, when the King was forced to become a constitutional monarch, he un-banned the political parties and press freedom was allowed. But even then there were very, very restrictive clauses in the press freedom laws. And of course during the civil war – which went on for ten years – the Maoist rebels were also intolerant of press freedom. In fact, it was when they came to power after the war, that they started beating up journalists and started being very thin-skinned. In your writing, you’ve said effective journalism can’t – and doesn’t – simply hold up a mirror to events, but nor should it simply pick sides and become an advocate for tat side. Ideally then, what should it be? It is a very fine balance. Its very easy to follow one side or the other – to become completely agenda driven and issue oriented and forget about the universal rules of journalism. Or alternatively, to become so bland and such a spectator that you don’t actually contribute to offering solutions to society. Instead, you just perpetuate the quarrel of the day. What we’ve done in Nepal is make sure you stick to facts, and listen to all sides. But you come to a conclusion, and you offer solutions. So you don’t just report on what a politician says. You try to find out why – and why the timing – and what effect this will have. You analyse. Because the media’s role is not just to inform. It should be much more to interpret, and to analyse credibly what is happening. And to point out who benefits from particular policies? Is there a risk that if journalism focuses on the human cost of social change, it can become a journal of victimhood – which then serves however inadvertedly, as an argument for retaining the status quo? Yes. That is something we become very conscious of, particularly in the work I did during the war… and also in the books we brought out afterwards, which did focus on the human cost. We were conscious of the fact that if we did this, the people who argue that you have to struggle against oppression with violence if necessary, could accuse us of being status quo-ists. But I think all modern wars have a human cost. The media traditionally – and particularly if you have this glamourised war correspondent who becomes a celebrity in his or her own right… for them, their work then can become an end in itself. Therefore, they focus on the battles, they focus on the body counts, they go to the scene of a bomb. They chronicle the carnage. It is to compensate for that extreme focus of war journalism that we try to swing it back – at least a little bit – to look more on the civilians and the non-combatants, and report on how they are affected by modern conflict. That sounds like you’re saying journalism can be an agent for social change more by accident than by conscious intent. And in the process, one person’s fine balance might seem like a lack of edge to someone else? Yes. What we have tried to do – with our books and our [photo] exhibition and our film – is to fill a gap that we thought existed in the media coverage of the conflict [in Nepal] and its aftermath. In your opinion, was anyone other than Crown Prince Dipendra involved in carrying out the royal massacre in June 2001? I’ve covered that story from the beginning, from the night it happened. Still today, new things are still coming out. The original story is still true, the fact that the Crown Prince killed them. Of course, 95 % of Nepalis don’t believe that. They think the brother [Gyanendra] killed everyone. Its like the death of Princess Diana, or the Kennedy assassination. So, there’s a Lone Gunman Theory – but a lot of other suspicions ? Do you see it as an act of personal aberration or as a political act? I think it was a personal act of aberration. Although family members interviewed later have said they knew it was coming. The guy was getting more and more out of control. There’s another debate going on now, as to whether he actually wanted to kill everyone, or just wanted to kill his father. Evidence is now pointing to the argument that he wanted to kill only his father, and that after he did so, he just ran amok. 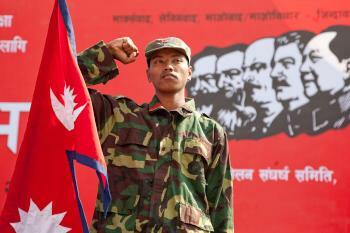 Looking at Nepal from outside in 2010, United Maoists are the biggest political party in the country. In this day and age, what makes a Maoist a Maoist ? Yes, people think it’s a time warp. Like, Mao is dead and in his mausoleum in Beijing and yet he’s alive and kicking across the Himalayan border, in Nepal. What the hell is happening here? Well…there is an international movement of Maoists, and they have a website…. It’s a solidarity group that includes what remains of the Shining Path in Peru, and the NPA in the Philippines, the FARC in Colombia. Yes, the Naxalites in India. Also there are people like the Khmer Rouge, who believed – and Pol Pot actually said this – that Mao actually chickened out and didn’t complete his revolution. So there is a feeling that with economic globalization and given the crisis of capitalism that’s happening now, that Maoism is perhaps not such a bad idea after all, and that Mao may have been right all along. Even the kids who were burning the police vans in London last week were calling themselves Maoists, right? 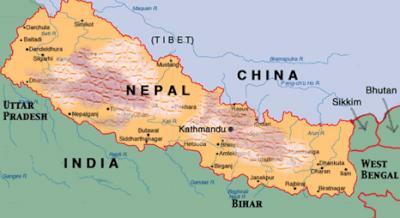 In Nepal, what’s been the core of it? The core of it in Nepal was that it was ripe for revolution. The objective conditions for revolution back in the 90s were ripe – the iniquities etc. Democracy had been re-instated [in 1990] for five or six years, but it didn’t look like it was going anywhere. Corruption was setting in. So one faction of the Maoists – because they’d split at this time in 1996 – felt this was a time to make the push for armed struggle. That’s why they launched it in February 1996. Another faction said: geo-political conditions don’t allow us to do this. There’s no support from India or China. We shouldn’t do it. But these guys did. And they fought for ten years. And the fact they spread so rapidly and had such ease…it was quite easy for them to recruit. Especially women, who seemed to have been doubly downtrodden – one, because they were women and secondly, because they were from marginalized communities. Does that mean the Maoists themselves feel that their current involvement in parliamentary democracy is merely transitional – and that they’re just playing at peaceful participation? There is a huge debate going on…in fact, the Maoists just completed [in late November 2010] an extended plenum. There is a hardline faction that doesn’t believe in the peace process, that doesn’t believe in this whole parliamentary nonsense, and which has said – we were SO close to victory and we should have just gone the whole hog. Is this the Baburam Bhattarai faction? I saw an online poll in your newspaper where Baburam had about 80% support among the general public. Since June there have been 16 attempts to replace the caretaker PM. I’m sure there are little explanations as to why each of those attempts came unstuck – but what’s the overall reason for the stalemate? Its due to the distrust among the Maoists, and with the non-Maoist parties. The non-Maoist parties believe that the Maoists are hell bent…and once they get into power they will never leave it. They will start trying to control all the institutions, including the Army. Which is what they actually tried to do after they won the election in May 2008. So, the other parties are just trying to make sure the Maoists don’t get to power. In this, they have an ally in India. Because of its own Naxalite problem, India does not want an unreformed Maoist party in control in Nepal, because of the moral boost this will give to their own Maoists. Really? Does concern about Nepalese support for the Naxalites really loom all that seriously on India’s agenda? Its not real. There is solidarity of course, like with all other Maoist movements around the world. In the beginning of our war, the Indian Maoists were training our Maoists. But there is no reverse flow. The Indians though, keep writing about it in their media. Yeah, it does look more like a phantom than a genuine concern. The Indians always do this. When they come up with a real domestic national security issue they always point to a foreign hand like Pakistan or China, or even Nepal. Even tiny Nepal can be a threat. (laughs) Recently though, the Indian government has announced a three billion dollar package to create jobs and development in the Naxalite areas. That means they’ve finally figured it out that there is no military solution. Which is what they finally convinced us to do…our peace agreement was brokered by India. They convinced us, but they couldn’t convince themselves to do the same thing in their own areas. Now, they’ve finally realized it. The problem with this deadlock at the moment is [more than anything] it reflects the divisions within the Maoists. This recent plenum bore this out. : the Baburam faction, the Baidya faction, and the Prachanda faction were all arguing it out over whether this path of parliamentary democracy and the writing of the new Constitution is the right path, or not. In this, the Maoists have been a victim of their own success. They have been so effective in indoctrinating their cadres during the war years, that Prachanda now finds it extremely difficult to de-indoctrinate them. Although he himself would now like to take the plunge and declare that the war is over, that we don’t need to be violent anymore, that we can now go for peaceful politics… He would want to say that, I’m sure, but he can’t because of the fear of a mutiny within the ranks. And in this, Baidya (pictured left) is the man who is the countervailing force. Does Baidya believe that that the more parliamentary process can be exposed as a sham, the more quickly the Maoists can take the direct route to power? Yes. All three factions believe this, actually. And even the King, whom we sidelined in turning Nepal into a republic, is up to mischief. He’s waiting for this whole thing to fall apart. So given the levels of mistrust within and between the Maoists and between them and other parties – and given that India has no interest in promoting an outcome it wouldn’t prefer – there’s no one really with an interest in resolving this deadlock right now? I think it should be up to the parties – to the democratic parties – to unite, and to have a credible alternative to the Maoists, and to a rightwing royalist government. 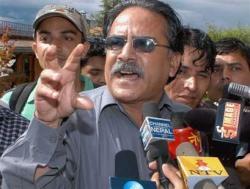 Prachanda resigned as PM in May 2009 after his failed attempt at sacking the Army Chief of Staff. Are the military able – or interested – in taking a decisive role in how this plays out? Not yet, not so far. They haven’t started behaving like some African countries – or maybe Bangladesh or Pakistan. I think things have to get a lot worse, first for them to stage a coup– a captain’s coup for example. Which would be a trigger for war. Yes. But at the moment, they’ve actually done quite well. Because remember, this is an Army that was controlled by the monarchy for 240 years. The Army’s history is interlinked with Nepal’s foundations and is linked to the royal family and to the King – who has always been the commander in chief. And yet since 2008, after Nepal became a republic, there has been a surprisingly smooth transition to being governed by the civilian command. The only hitch was when Prachanda was trying to install his own commander in chief, and then the President overruled him, and then he had to resign. But even that was a good thing. 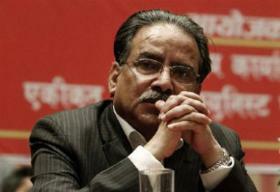 Prachanda, after he lost the support of his coalition partner – after that debacle – he resigned. He didn’t go back to war, he didn’t go back to the streets and try to create mayhem. So actually, we forget in Nepal how dramatic our political transition has been over the last four years, from monarchy to a republic. The King had his press conference after Parliament voted for a republic and .. then he said bye bye, I’m off, and he became a citizen. Yes, he is now trying to find ways to make a comeback, but for all practical purposes, we are a republic for the foreseeable future. But how is the current deadlock going to be resolved? The only thing is for the second echelon moderate forces within the three parties to get together and let cooler heads prevail. And in this, I think India’s role will be critical in steering it because India is just so huge and has such a strong gravitational pull on Nepal, and on all the countries actually, that orbit it. How is that possible when Prachanda continues to describe India as Nepal’s main enemy? Or is that mere rhetoric, given the dominance of India in the Nepalese economy? Prachanda tried to do the same thing after he was ousted. He tried to get the Chinese to help him to counter the opposition the Indians had to him being Prime Minister. But the Chinese totally rebuffed him. So its very clear now since he’s come back from China – he was there two months ago – and he’s got the message from Beijing that south of the Himalayas is India’s sphere of influence – and you [Prachanda] has better come to terms with it. Sort it out with India, don’t bother us, we’re busy. 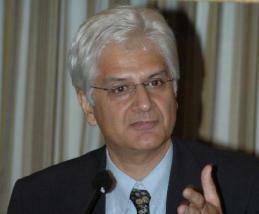 Now that he’s got the message, India’ role becomes critical. Will India do it for its own self interest …or will it do it for political stability? That’s the question. So, we want Indian policy towards Nepal to be more critically altruistic, and to be looking at Nepal’s interests rather than their own. Their interests will be there anyway. And presumably their interest – and Nepal’s too – could co-incide if a more pragmatic figure like Baburam prevailed among the Maoists. That’s if India accepts it has to live with a united Maoist party governing Nepal in future – and given that it probably regards Prachanda as a loose cannon, and Baidyu as something even worse. Yes, and the dilemma for them – and they really would prefer Baburam – is that Baburam is just so weak within the party in terms of support, numerical support. This last plenum showed that Prachanda commands 80 % within the party. That leaves Baburam out…But Prachanda’s game of antagonizing India and calling it the public enemy is so risky. Nepal’s policy should be not to get India and China to fight over us. We shouldn’t want that. We should want them to co-operate. Their nine per cent economic growth between them could pull as along like a double locomotive. In this whole debate, we have completely forgotten the economy. We have completely forgotten about development, and what is happening in the countryside. Nepalis are poorer than ever. We need investment, we need jobs so that our young people do not need to migrate to find work. And it is getting worse and worse. All the factors that led to the war in 1996 are still present. That’s a question I’d wanted to ask you. Is there much of a system of local government and delivery of social services in most of Nepal? The great thing is that what was started in 1990 – the experiment with grassroots democracy and local governance and de-centralisation – there is a momentum from it that is still carrying through. That is why the war was so wasteful, the Maoist war. They wanted a shortcut to power. What they didn’t realise was that although the politics at the national level was rotten, things were working at the grassroots. For the first time in our history, because of local elections, we had accountable local leaders who were delivering services through a democratic process. The war decimated that. Yet luckily, the leaders who were elected at that time are still the village elders and are still accountable, and respected. So these people are still carrying through at the local level, despite the disarray and the paralysis in Kathmandu. So if central government could only get its act together, there is potential for immediate recovery? You know, the great thing about Nepal is that it has a critical mass. 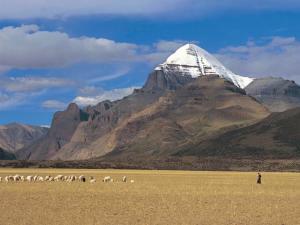 [Population : about 30 million] It is not too vast like India. It is not too small like Maldives or Bhutan. Its just the right size to bounce back if the policies are right, if the governance is right, if the leadership kicks in. You can see that with the tourism. With two years of relative stability, tourism this year was hitting 650 – 700,000, which is a record. So what is going to happen when the UN mission leaves on January 15? Ahh right, that’s a big thing. The two dates to watch out for are January 15 and May 28 next year. January 15 is now looming, and there has to be a mechanism found to manage the Maoist camps that now house about 19.000 of the former guerrillas, with their arms. These need to be monitored by perhaps a special committee of government, the multi-partisan committee. And a joint military commission. Which is already in existence – it just needs to be beefed up, and given more teeth. Then perhaps [in addition] a skeletal UN supervision of the process. I hear now that the UN monitoring mission in Nepal is going to get another very short term extension. Because we couldn’t get our act together. If the basic problem is the re-integration into society of the former guerrilla fighters, is there much potential for integrating them into the Army? The Army has said absolutely no. And India has backed the [Nepalese] Army on that. Because the Indians have 60,000 Gurkha soldiers in their army. And they don’t want our Army to be infiltrated by the Maoists…I think the only compromise solution is …while the Army will never, never take 19,000 perhaps a few thousand [is possible.] Two to three thousand in different units. And what’s the issue with May 28? That’s the extended deadline – and it has already been extended by a year – for the completion of the writing of the new Constitution. Which is a deadline that is also obviously not going to be met. Part of the obstacle in all this is the distrust between the parties. But like I said, if pragmatic and moderate leaders can get together and come up with a power-sharing agreement, and steer it through – than all these other things will fall into place. Finally then, if the splits within the Maoist camp are the crucial factor in Nepalese politics – what is the actual basis of the friction between Baburam and Prachanda? It is a personal animosity. It is not ideological. It goes back to the 90s doesn’t it? The big split they had was in 2004. Baburam and his wife – and his followers way up in the mountains where the war was still going on – were actually placed under house arrest. The split was about what to do with India, it was over India. And it was actually the Indian moderate communists who thrashed that out and forced Baburam and Prachanda to shake hands. That lasted for the duration of the rest of the war, as well as into the peace process. But it is now fraying again. Baburam’s statement at the plenum was scathing about Prachanda’s personality cult, his corruption, the fact he was getting his family members in, and that he was going soft, Ideologically, I don’t think Baburam is a pragmatist – he is a real, born again Maoist. But on tactics, I think he is a pragmatist. So where is the end game for him – given that he can’t achieve his agenda, and since I presume he is seen as being soft on India by the hardliners in the party? Yet from what you’re saying Prachanda has also painted himself into a corner – especially when it comes to India? But even if a hardliner like Baidya can see the flaws in this guy, who is going to be the figurehead of the Maoist political project in its next stage? I guarantee you [with that message] they would win two thirds of the vote. Because in the last election, even anti-Maoist people voted Maoist – and why? Because it was seen as being a vote for peace. People thought that if I cast a vote for the Maoists at least they will leave the jungle and come into mainstream politics. Even more people would be convinced if they do it again, this time. So there is a way out.